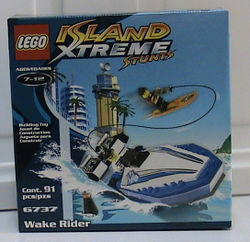 6737 Wake Rider is an Island Xtreme Stunts set released in 2002. It contains Sky Lane on a surfboard attached to The Brickster's boat. It consists of 91 pieces. Facts about "6737 Wake Rider"